Eltronicschool. - This is one of circuit schematic for electromagnetic field sensor using the main IC 741 that will help you to build of the many sensor reference in this time easily. Beside we will give you circuit schematic of Electromagnetic Field Sensor using 741 IC, we also will show you the component list needed and also global description about this circuit from original source. 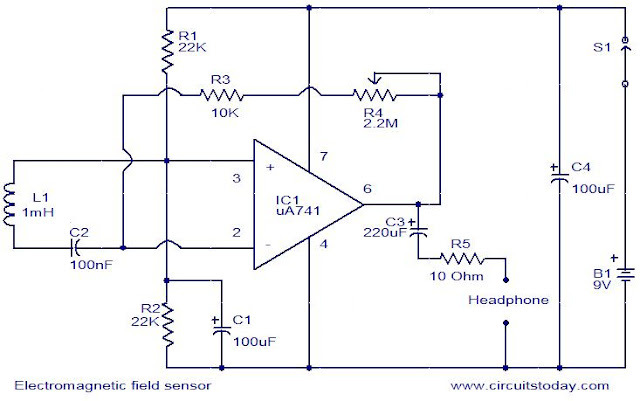 Circuit schematic like in Figure 1 above is Electromagnetic Field Sensor using 741 IC. According Circuitstoday blog describe that this is a very simple circuit that can be used to sense electromagnetic radiations. The circuit can even detect hidden wrings. A 1mH inductor is used for sensing the electric field. The electric field will induce a small voltage in the sensor inductor and this induced voltage is amplified by the opamp.The headphone connect at the output of the opamp will give an audio indication of the electric field. For example, the electric field around a mains transformer can be heard as a 50 Hz hum. The POT R4 can be used to adjust the gain of the amplifier. By keeping the sensor inductor near to a telephone line, you can even hear the telephone conversations.